1 item: $12.956-11 items:$12.50 ea.12 and up: $11.95 ea. 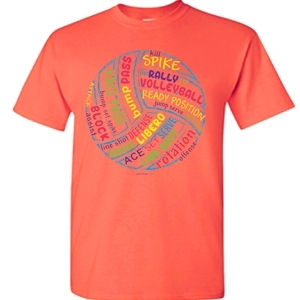 VOLLEYBALL BALL & WORDS Bright Neon Coral Volleyball Tee Shirt from Image Sport features Lots of Fun Bright Volleyball Words to show your love of the sport of Volleyball. The Colorful Volleyball Words on the front of the T-Shirt include: Block, Rally, Jump Serve, Defense, Screen, Hit, Dig, Bump, Pass, Set, Spike, Serve, Ace, Line Shot, Side Out... and many more! 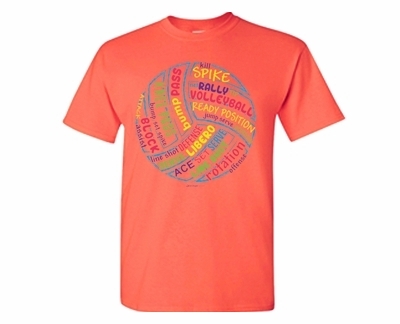 Neon Volleyball Words & Ball Short Sleeve Shirt is a 50% Cotton / 50% Polyester blend. * This T-Shirt design is available in the color Retro Neon Coral Heather only. * You can Mix & Match Sizes of this Volleyball Shirt to get Quantity Prices!